Danny Lyon, a photojournalist, immersed himself in the civil rights movement of the early 1960s. As recounted in his 2014 memoir The Seventh Dog, he flung himself onto the front lines, serving as one of the few white members of the Student Nonviolent Coordinating Committee (SNCC).This Lyon, a New York native who was not trained as a professional photographer, disliked the stories published by LIFE magazine. Its photos of the fight for racial equality, in his view, were idealized and almost plastic, failing to convey the raw emotion behind what he had seen in the South. 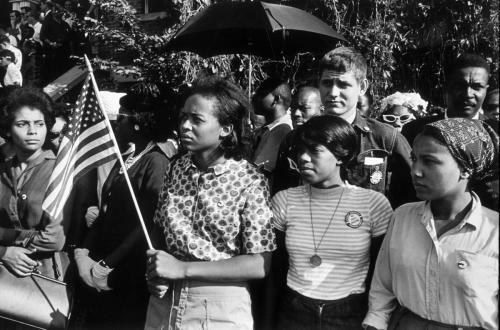 He was aware the civil rights struggle had begun long before the 1960s, and was far from over. Lyon is one of many photographers represented in Women and the Civil Rights Movement, an exhibit on view at the Chrysler Museum of Art, 1 Memorial Place, in Norfolk until Oct. 30, 2016. The show features pieces of sweeping origin and scope, from defiant demonstrations to the casual every day, from the 1930s to the 1980s. The individuals shown in the images, however, have at least one thing in common: they are women who pushed boundaries, making the case for racial equality. “I’m trying to tell a wider story,” said Alex Mann, the Brock Curator of American Art at the Chrysler. 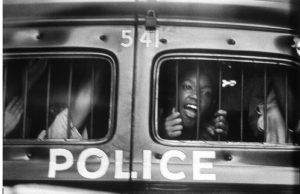 In the exhibit, a photo of Billie Holiday, shown portrait-style and smiling, sits near an image of unnamed female teens, seen through the bars of a police vehicle. “What can we learn from a beautiful image of Billie Holiday? What does Billie Holiday have to do with the civil rights movement?’” Mann asked. Holiday, a Black woman who overcame the odds to achieve celebrity, used her musical platform to protest racism in America. Her 1939 song, “Strange Fruit,” lamented the frequent lynchings seen throughout the South, drawing early national attention to the civil rights movement. Holiday and the protestors on the ground all used their voices, albeit in different ways, to drive progress. Additionally, by weaving together a collection that bridges a broad period of time, Mann hopes to inspire patrons to question the current state of racial affairs. “Which of these problems were solved in the 1960s, and which were not?” he asks. Some Hampton Roads residents have sought to wrestle with Mann’s question on their own. Take, for instance, the Silent Mile, a Tidewater coalition that crosses boundaries of ethnicity, class, gender, ability, sexuality and religion and is committed to addressing tensions between police officers and people of color. “We really want the Silent Mile to be a catalyst for change in ally advocacy, police accountability and defending the right to due process and equal protection under the law,” said Janelle Burchfield, one of the community organizers. At a meeting in Norfolk on July 13, more than 500 members of the Silent Mile commemorated African-Americans who have died in recent confrontations with law enforcement. Participants wore the names of the deceased individuals, written in white marker against black masking tape, and marched in a protest at the Hague Bridge, in view of the Chrysler Museum. Inside the museum, at the “Women and the Civil Rights Movement” exhibit, were photographs from nonviolent protests during the 50s and 60s. “We wanted something to bring the community together to march a silent mile against police violence without trial,” said Burchfield. This is not the only connection between past and present found in the photographs on display at the Chrysler Museum. In an image by Charles Moore, Rep. John R. Lewis from Georgia, then a young man, can be seen at a restaurant sit-in, peacefully repudiating segregation. Lewis recently staged another sit-in, this time to protest gun violence, on the floor of the U.S. House of Representatives. Like Rep. Lewis, many of the individuals featured in “Women and the Civil Rights Movement” had careers in activism that lasted long after the pictures were taken.